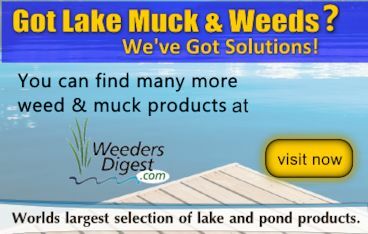 Introducing the LakeGroomer from Weeders Digest. Enjoy your beach again by naturally killing and removing all aquatic weeds & muck from your shoreline! The Lake Groomer easily mounts to any dock or pier but can also be mounted with our tripod kit allowing you to move it anywhere you choose. The entire unit can be installed by a single person in less than 1 hour. Once installed the rollers will get to work rolling along and agitating the lake bottom. This will pull up rooted weeds and stir up any loose organic debris sitting on the beach bottom. You can expect to see a dramatic difference in as little as 2 days of using the Lake Groomer. As long as you have this amazing machine you can be sure that seaweed and muck will be a thing of the past. This system can also help reduce Zebra Mussels. The standard model Lake Groomer comes with 21 feet of rollers (3 roller tubes each measuring 7 feet in length). That gives you the ability to maintain and area with a diameter of 42ft. You can add up to 6 roller tubes for a total coverage of up a 82ft diameter area! The lake groomers powerful electric motor head is fabricated of rust-resistant aluminum, and the aluminum roller tubes are 8 inches in diameter by 7 feet long. The basic hardware attaches to docks with two inch diameter support legs and adapts to either round or square dock posts. Mounting hardware for larger dock leg posts is available. An optional tripod mounting kit is available, allowing the lake groomer hardware to be self-standing if needed. Electronic components are encased in weatherproof epoxy. A 70-foot power cord can be plugged into a standard land-based GFI circuit outlet. The entire Lake Groomer apparatus is backed by a three-year warranty. The system utilizes standard 110-volt household current converted to 28-volt AC via the power converted. An eight-amp circuit breaker is included on the 28-volt AC side of the power converter. The 7’ rollers bolt together with a steel coupler at the anchor point. This can be extended to create a length of 42 feet for a total of an 84ft coverage area. Along the stretch of rollers there are couplers at seven feet intervals to allow for maximum adaptability to the contours of the lake bottom. Additional couplers can be purchased to add maximum flexibility to the groomer. 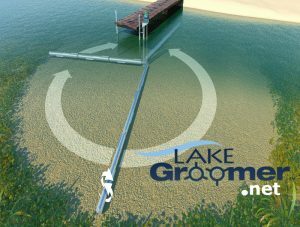 The Lake Groomer automatically senses heavy weed and muck conditions. If it runs into an area that is too dense to get through, or comes in contact with your dock support legs the Groomer automatically reverses and then tries six more times to get through. If after these attempts it still gets stuck, the unit automatically powers down. Although this is rare it can happen. In this situation the user would have to manually remove the obstruction. It easily rolls over small rocks and other objects. Watch the VIDEOS on the right side of this page to learn more! 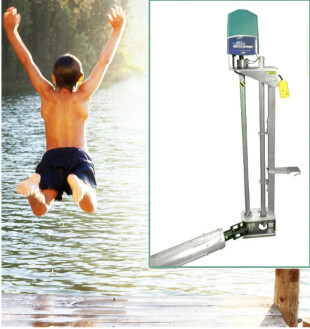 If you primarily have issues with MUCK then you may want to check out our AquaThruster Muck Mover! Visit AquaThruster.com to learn more!